East Java (Jatim) Park is located in Jl. Kartika 2 Batu offers recreation tourism of new entertainment amusement for all level. It begins from children, finite adolescent until grandmother and grandfather. Of course, this tourism object has drawn up as family tour area in East Java. To get to the location, is not too difficult, because, the object only 2, 5 kilos meters from Batu city. This tourism object is about 22 hectares width with 850 meters height to sea level, save the multifarious knowledge, and recreation area with various supporting facilities for having relax. Jatim Park may have said as the different tourism object in East Java province, besides offering a recreation place and study center, we will get many kind new knowledge. Jatim Park has at least 36 kinds of facilities which able to be enjoyed visitor. Before enjoy all supporting facilities for recreation area, the visitors will find an interesting view of ‘Galeri Nusantara’. Then stepped into ‘Taman Sejarah’, which contained of miniature temple in East Java like Sumberawan temple (Singosari - Malang regency), customhouse of Kiai Hasan Besari Ponorogo and Sumberawan Statue. The other facility which able to be enjoyed is ‘Agro Park’ presenting crop and rareness fruits, animal diorama, which consists of unique animals that have been conserved, supporting games (bowling, throw ball, scooter disco), Ken Dedes and Ken Arok food centre, etc. 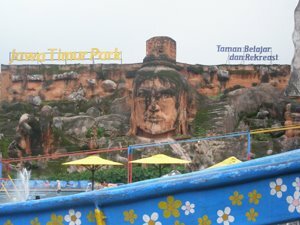 Jatim Park is suitable for family recreation. The recreation area sites here offer unforgettable tour and can used as alternative media of study for your children.